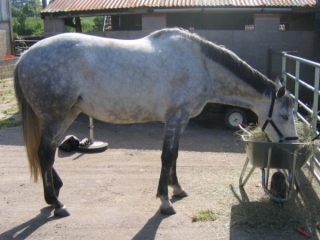 Shortly after being purchased by her current owner it became apparent that this mare was uncomfortable, not only in her feet, but throughout her back and shoulders too. This meant she would not move forward freely, frequently bucked and found it difficult to canter correctly. Although X-rays revealed no changes to the navicular bone, the vet had detected pain in the navicular area at the back of her hooves and this was affecting the way she walked, which in turn impacted on her overall muscle tone. She was put in egg bar shoes for a few months, but this was clearly not helping matters, so her shoes were removed in December 2005. 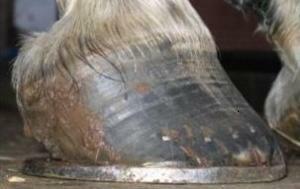 Navicular syndrome, and Navicular disease are complex conditions that require careful rehabilitation. 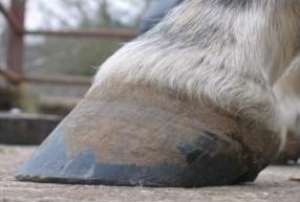 Traditional treatment has been based upon corrective shoeing which often provides short term relief, but the long term prognosis is usually guarded. The HPT Method has a phenomenally high success rate in returning horses displaying navicular pain to full soundness, provided the horse is taken out of work and given time to heal and the owner is dedicated to the horse’s daily hoofcare programme. 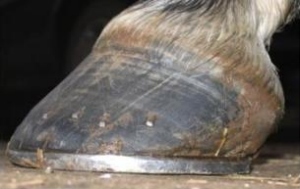 Most of this mare’s hoof problems were due to severely atrophied soft structures in the navicular area which were causing pain, resulting in her reluctance to land heel first. She also has one upright front hoof and one flat hoof. 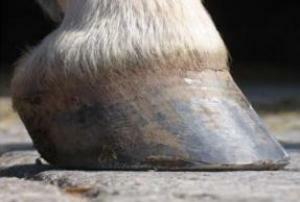 Use of supportive hoof pads inside hoof boots improved her comfort and enabled her to begin a program of daily walks in hand and groundwork on sand to begin to strengthen the soft tissues inside the hoof. Overall, it took about 6 months before she was able to land confidently heel first and she is now being hacked out and re-schooled. Her rehabilitation has been a team effort between the trimmer, the vet, the physiotherapist, her trainer and her dedicated owner. She is now being fitted for a new saddle to accommodate her improved muscle tone. The photos below show the both front feet before shoe removal and after 6 months of EP care.